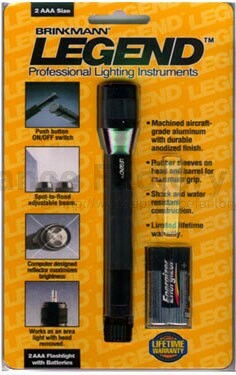 Legend 2-AA Flashlight w/Battery Machined, aircraft-grade aluminum with durable anodized finish. Spot-to-flood adjustable beam. Rubber sleeves on head and barrel for maximum grip. Push button ON/OFF switch with locking feature. Water and shock resistant. Includes 2 AA Energizer batteries. We're adding new 860-0420-0 parts all the time, contact us for pricing and availability.